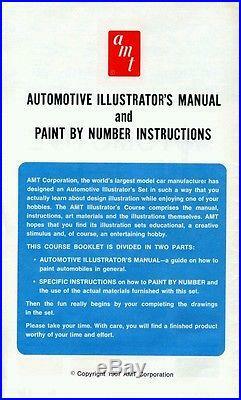 Presenting an Ultra Rare 1968 AMT Deluxe Automotive illustrator's Complete Water Color Paint by Numbers Set. 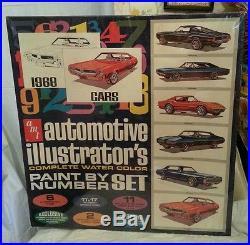 Featuring six 11" × 17" Muscle Cars cars to paint as follows: Chevy Corvette , Ford Mustang , AMC Javelin , Pontiac GTO , Dodge Charger , Mercury Cougar. 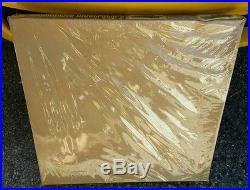 Box Size : 18.5" x 17.5". 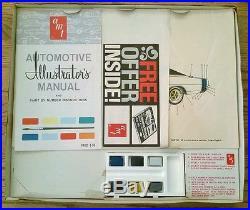 Complete with 11 assorted colored Paints, 2 Paint Brushes , Automotive illustrator's manual and painting instructions. This AMT deluxe paint set rarely if ever turns up no less sealed mint. There are no examples to be seen on the net. The only examples to be found are the smaller 2 panel sets. A 1967 set with a 1955 Chevy Nomad and a 50 T-Bird and a 1968 set with a Mercury Cougar and Dodge Charger. The two photo examples of the open box and manual back cove included shown in this listing are from this link below and not included in this listing. Or just Google it and you will see the complete smaller set and page by page shots of the interesting manual and other photos of the set. 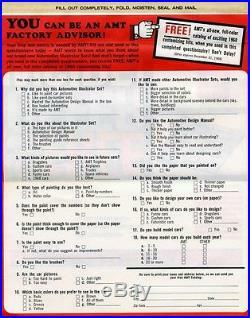 Definately an offbeat product from the AMT model kit company. I have owned this set since 1997 and have never seen another. 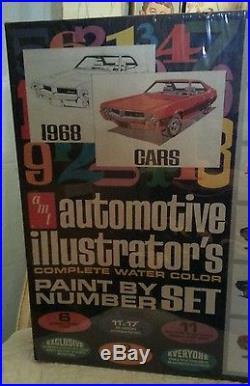 The item "AMT AUTOMOTIVE ILLUSTRATOR'S PAINT BY NUMBER SET 1968 RARE Model Kit GTO" is in sale since Friday, March 18, 2016. This item is in the category "Toys & Hobbies\Models & Kits\Automotive\Vintage". The seller is "itscoolman" and is located in Franklin Square, New York.